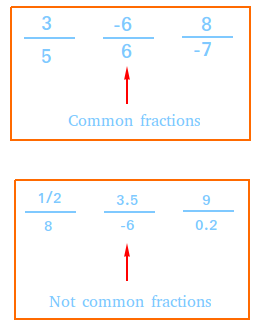 Definition of common fraction and examples. A common fraction is a fraction whose numerator and denominator are integers. A common fraction can be used to name part of a whole or set. For example, John did not eat 5/8 of the whole pizza. 5/8 is a common fraction. Notice that 5 and 8 are integers. A common fraction can be used to express a division. 4 people doing business together owe a bank 2500 dollars. If they share the debt equally, how much money does each person owe the bank ? Each person owes -2500/4 dollars and -2500/4 dollars is a common fraction. 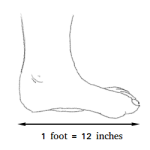 A common fraction can be used to name a ratio. 4/3 is a common fraction.